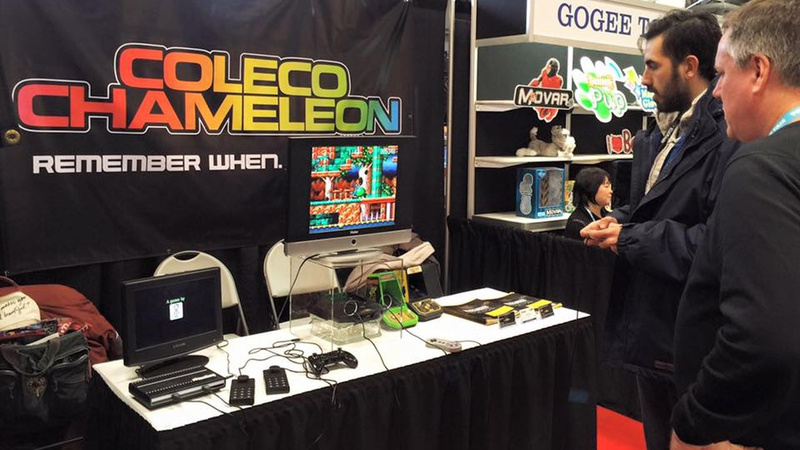 "We wish them luck in the future"
Coleco has announced that it is walking away from the Chameleon console project after reports surfaced that the prototype shown off at the recent New York Toy Fair had a SNES Jr. inside it. The Chameleon was supposed to usher in a new era of cartridge-based gaming, and was billed as being able to emulate pretty much every retro console from the past few decades. The team behind it originally tried to crowdfund the system as the Retro VGS, but failed to generate the cash required. Coleco's involvement was intended to give the console a more recognisable brand name, and a fresh crowdfunding drive was expected this year - but accusations of fakery resulted in Coleco insisting that the Retro VGS team produce a working system for them to inspect. That clearly hasn't happened. Retro VGS has decided that the work that they have created is not sufficient to demonstrate at this time. Consequently, we can no longer proceed with the project and the Chameleon project will be terminated. This separation is amicable. We wish them luck in the future. We thank the gaming community for their continued support, input, vigilance and trust. The news follows the departure of David Giltinan from the project, a key figure who insisted that Retro VGS never intended to deceive, but decided last week that he could no longer be associated with the console or the company behind it. Our intention is genuine to come out with something unique under the Coleco brand. If that's not happening with this group, we'll be doing it with someone else. Sometimes when you have something like this happen, maybe there's a group out there that can do it, and help us introduce a better product. Any partner we do business with has to be 100 percent transparent. If that's not the case, we're not going to go forward with any partnership, license or otherwise. A lot of this is new information to me. But we have great relationships with other companies, and we will produce new products for Coleco fans. We've approach the Retro VGS team for comment and will update this post if we hear back. I doubt we will hear back from them except to say the company ha disbanded. Ouya was a real project. This is only a huge fake. Using SNES hardware in their prototype was pretty telling that they were winging it. Bit of a shame this non-product made it as far as it did. It does however demonstrate how difficult making even a simple video game console is. Perhaps I can better appreciate even industry leaders like Nintendo, in their development and marketing of dedicated video game consoles. Truly a lot of excellent pieces need to come together to make a successful gaming console. We are certainly aware of the many companies large and small that have not achieved that success. Serves those idiots right for trying to fool people. It they'd been more open about things, and not stuck a snes in a box, this probably wouldn't of happened. I'm just glad they never got the Kickstarter. The Jaguar was a pretty big desire for me growing up and only ended up briefly owning one a decade ago. Would have been cool to have a console with that shell but good technology inside. What a shame - I would love a viable piece of hardware to run my colecovision and Atari carts! Meanwhile though, how about an update to the colecovision flashback console?!? I'm glad I bought the Retro Freak, now. Actually, I was fine with the Freak any ways. I'm not sure why anyone would try something like this, today. There is just too many people that have too much access to try to pull something like this over on them. I really wish Coleco would have sued the pants off those conmen. They likely wanted to this behind them as soon as possible. I'm least bothered whether it shows up or not. Besides Pitfall, nothing would make me want to get the Chameleon anyways. I just wish I knew what the endgame was here. Like were they hoping the fake console would get enough interest for funding and then they'd build an actual console or what? They don't even a circuit board at this point, it's not as though oh the console plays unity games but they're having trouble getting the emulation working or something. Were they hoping to take the kickstarter money and run or something? It doesn't make sense. Things like this makes me cautious of any new company trying to sell people on a new console idea without so much as a completed, fully visible prototype. For example, the Smach Zero. All renders, no prototypes. They keep speaking of recommendations from AMD and how they can create an amazing handheld with cool concepts. But nope, no one was buying into their BS, especially not worth the insane price they were asking for. @AVahne well it's a bit different here. They stated they had a working prototype and were seeking funding to finalize everything and put it into production. That turned out to be all lies. But as others have said in various locations if someone is seeking funding to make a prototype then be cautious cause they're more than likely never going to get off the ground. @LemonSlice Coleco couldn't, it's not like they used the Coleco name without permission. Good on Coleco. Hopefully things like this will teach people to be wary over what they support and willfully give money to on Kickstarter. Ouya at least got into the stores with a slightly unique downloading shop and really isn't this at all. I saw this advertised with a kind of cheap posted at a used game store recently and they just stuck it by all the other multi-use consoles that support all the old cart systems, so it's not like most anyone was getting excited for this. "And the Chameleon is actually . . ."
"And I would have gotten away with it if not for you meddling kids!" This is like a worse version of the Ouya. And that's saying something. The Ouya at least had online support and functioned as its own console. This was a hodgepodge piece of hardware that used bits and pieces from other consoles (SNES internals for the prototype, an Atari Jaguar shell, a third party Wii controller, etc.) and didn't really have any actual point. I was expecting this. Good. The Retro VGS crew should really hang it up now, because no one is going to trust them with anything they attempt in the future after the repeated frauds they were perpetrating. I'm really happy with the Retro Freak. I can see this hardware type for people who don't own the originals. But I guess the direction of travel is digital, so it won't happen. @Madder128 no prob, Omega Man.